It takes about two pounds of Pure Maple Syrup to make just one pound of our Pure Maple Butter; but is it ever worth it! The syrup is heated until it thickens then skillfully whipped into a pure maple spread with nothing added to spoil the intense, pure maple flavor. 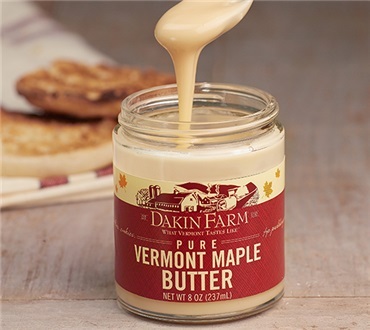 A delight for any maple lover served on toast, English muffins, cornbread, cookies, cupcakes or any place you might normally find ordinary white sugar frosting. A little hard to spread out of the jar , but a very nice maple flavor. Will have to buy bigger jar next time! The texture of this maple butter is gritty. The sugar is not fully processed to produce a smooth texture. Superb Dessert In A Jar! Mostly, I buy these to "store" as occasional gifts during the year. I try not to open one for myself because it seems to disappear far too quickly!! !